The best product for you depends upon your goal. If all you want is to learn a little Spanish, then all you need is our free stuff. But, if you have a higher goal, read on . . . Better grade or speak conversationally? If you just want to get a better grade, then premium membership is probably all you need. But if you want to speak Spanish conversationally, then Camino del éxito is the way to go. And, it is the only course that is fully integrated with the material on this website. complete audio conversational course (45 units, 3 different levels + 6 free months of premium access to www.studyspanish.com per level that you purchase). 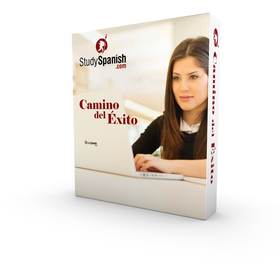 18 free months of premium membership to www.studyspanish.com, a value of over $100 for free). Just want a better grade? Premium membership gives you access to many more practice activities. Want to speak Spanish conversationally? Get our complete, step by step conversation course – 3 levels (beginners, intermediate and advanced) + 18 free moths of premium access to www.studyspanish.com. What’s included in the premium content?